As a hypnotherapist you're likely to come across many fear and phobia cases in your practice. People can be afraid of a whole manner of things and what may be totally acceptable to one person can be panic provoking to another. 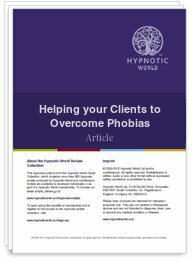 This article helps you to identify some of the more common phobias and helps you to understand why people develop fears and phobias, what the difference is between the two and a method of pinpointing the cause or onset of the phobia so that you can overcome it.